Norway, officially the Kingdom of Norway, is a sovereign and unitary monarchy whose territory comprises the western portion of the Scandinavian Peninsula plus the island Jan Mayen and the archipelago of Svalbard. The Kingdom included the Faroe Islands, Greenland, and Iceland. Norway has a total area of 385,252 square kilometres and a population of 5,213,985 (May 2016). The country shares a long eastern border with Sweden. Norway is bordered by Finland and Russia to the north-east, and the Skagerrak Strait to the south, with Denmark on the other side. A constitutional monarchy, Norway divides state power between the Parliament, the Cabinet, and the Supreme Court, as determined by the 1814 Constitution. The first postage stamp was issued in 1855, and depicted the Coat of arms of Norway. At the same time, numeral cancellations were used to indicate the post office using them, the numbers eventually reaching 383. In 1871, Norway introduced its first stamp with a posthorn design; stamps of this type, with periodic redesigns, have been in use ever since. 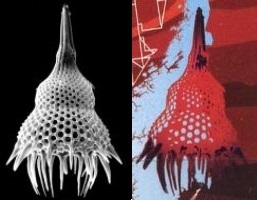 Fossil radiolaria (Lamprocyclas maritalis), map of Norway and continental shelf, oil rig and ship, pipeline, and geological cross section shown on stamp with face value of NOK 6,00. [A1] Michael Sars (1805 - 1869), shown on the blue stamp, was one of the last great descriptive zoologists who catalogued organisms more or less equally successfully in all major animal groups. Sars also described fossils from various fossil beds in Norway and appears to have been keenly interested in all sorts of other issues. [A2] Two geologuist shown on the stamps have had significant contribution to Paleontology. Waldemar Christofer Brøgger (10 November 1851 – 17 February 1940), who is depicted on stamp with face value of 140, was a Norwegian geologist and mineralogist. His research on Permian igneous rocks (286 to 245 million years ago), include some fossils, of the Oslo district greatly advanced petrologic theory on the formation of rocks.